The leaves have just started falling here in Colorado (ahead of schedule, I might add!) and few cooler temperatures have been trickling in. The changes of the seasons are always welcome here as they signify the rebirth of nature. The second a leaf falls, I step into action and start thinking about the changes I will be making for the new season. First, I start by pulling out all of the decorations I used the year before and then determine how much of it I will use and how I am going to change things up. Typically, I start with my island to set the theme for the rest of my fall decor. Today, I am going to show you how I created this Fall Vignette with Velvet Pumpkins for our island. To begin, here is the centerpiece I created last year for my island. I loved using these velvet pumpkins last year, so I decided to feature them again, but in a different way. To see the details of this centerpiece, you can go visit my Fall Kitchen Tour. Next, I added in the smaller green pumpkins and the adorable cotton spheres I bought from Hobby Lobby. The cotton balls are actually Christmas ornaments that I found in the Christmas decorations section of the store. I just cut off the rope loop on the ornaments and voila. The faux sunflowers and candles were layered in next. Any variety or colors will work…be creative. I love the texture that the sunflowers add, plus they so prevalent in fall. I also purchased them at Hobby Lobby. Finally, I placed in the tiny fall elements. The pine cones actually came from my yard. Use a tray or platter that you already have as the base for the design. I have had this serving platter for years and use it all year long, both for serving appetizers and for home decorating. I particularly like this one because it is flat and so large. It was perfect for this fall vignette with velvet pumpkins! Invest in neutral statement pieces that can be reused each year. If the statement pieces are neutral, you can change up your color palate in the future. For example, mixing my brown pumpkins with different shades of pink would be so beautiful (hmmm….maybe I will do that next year)! They would also work well with oranges and yellows and even blue tones. So many options!! Your tastes and styles typically change over time, so it is good to have neutral accessories that can be accented with new colors you want to feature. Incorporate items you can use in other ways. Often, for Christmas, I decorate at least one of my trees with a natural, rustic theme. I will definitely be reusing the cotton ball spheres on one of my Christmas trees this year. I am also going to use them for a casual fall table setting I am planning for an upcoming luncheon I am hosting. Shop for the fall accessories at discount stores. I bought most of the elements I used for this vignette from Hobby Lobby and Big Lots. TJ Max and Michael’s are also a go-to for sure! Utilize natural elements from outdoors. My husband always rolls his eyes when he sees me running outside with my clippers. Ha!! Seriously, I am constantly cutting off branches, picking up my pine cones (let me know if any of you need some…I have an overabundance here! ), trimming my herbs, etc. You can see here how I used herbs from my garden to freshen up this tray in my kitchen right now. I hope you have gained some good ideas about how to create a fall vignette with velvet pumpkins or actually any kind of pumpkins. Here is a shot of the back side of the centerpiece. 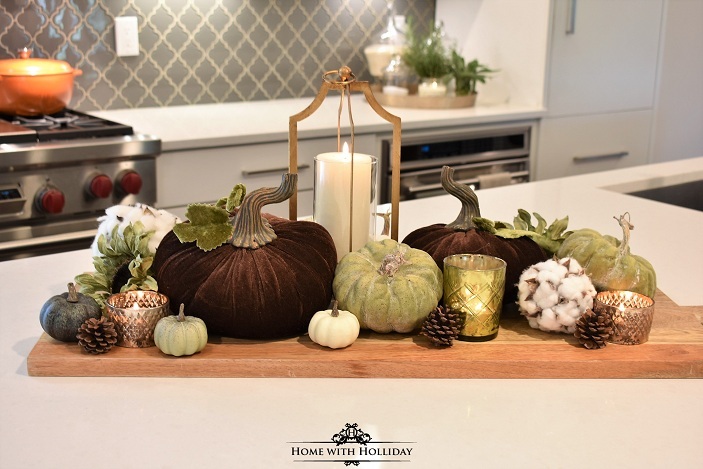 Love your fall vignette, especially the combination of the brown velvet pumpkins with the green pumpkins. I’m thinking of using green pumpkins in my fall decorating this year. they are so pretty. Thank you, Sandy! They are such a natural combo! Go for it with the green pumpkins! Thank you for stopping by! Have a great day. This is really a lovely combination! The cutting board made the perfect base and the different textures and colors mixed together are so pretty. Thank you for your kind words Stacey! And, thanks for the pinning! I really appreciate it! So lovely! I love green!!! And those velvet pumpkins! Sigh!!! Beautiful autumn colors in your vignette. Love it! Thank you so much, Michelle! I am so glad you stopped by and I appreciate your comments. Have a great day! As much as I adore your velvet pumpkins, I am in awe of the fact that you have a 16′ island!!! I am going to search your blog now for kitchen pictures. There will be drool, I am sure. The velvet pumpkins are my favorite for the fall! I agree, Maria! So lush, textural and elegant! Thank you for stopping by! LOVE velvet…especially when it comes to pumpkins and all things fall!